Books, journals, databases, websites, guidelines, rating scales and humor concerning evidence based medicine. "Evidence based medicine is the conscientious, explicit, and judicious use of current best evidence in making decisions about the care of individual patients"
Evidence based medicine - what it is and what it isn't. David Sackett et.al BMJ 1996;312:71-72. 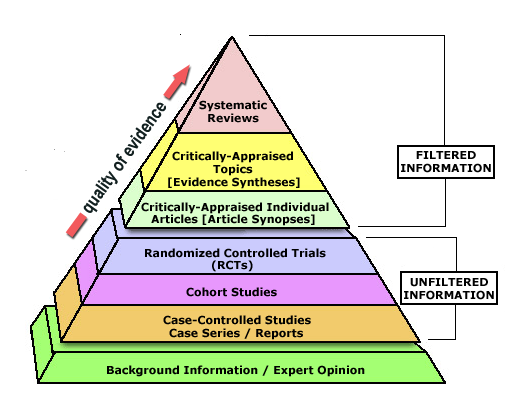 This graphic shows how the quality of evidence increases as the study design and information filters change. A web-based tutorial intended for any health care practitioner or student who needs a basic introduction to the principles of Evidence-Based Practice. The 5 steps of evidence based practice. 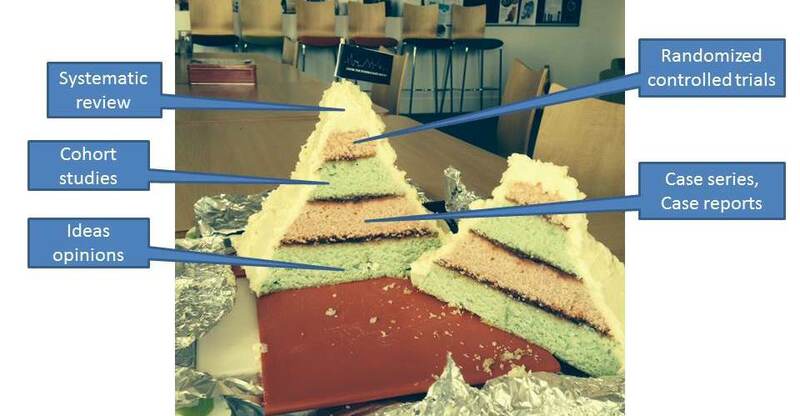 From the Centre for Evidence Based Medicine, Oxford, UK. Full text PDF - Ried K. Interpreting and understanding meta-analysis graphs: a practical guide. Aust Fam Physician. 2006 Aug;35(8):635-8. PubMed PMID: 16894442. Free series describing how to interpret results from a variety of study designs. Originally published in the British Medical Journal by Trisha Greenhalgh, 1997.